Click on image to be taken to the video. Zimbabwe’s government has warned protesters they will face the “full wrath of the law” if they continue with the biggest demonstrations in a decade against President Robert Mugabe, which have been encouraged by a preacher. 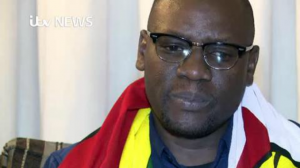 Baptist pastor Evan Mawarire has now been arrested by the Zimbabwean authorities, but he told ITV News before his arrest that his generation is “no longer afraid” of repression, and “enough is enough”. Mawarire became a household name in Zimbabwe after he started a social media campaign in April that has tapped into mounting public anger over corruption, high unemployment and economic woes. “I have been able to hear from so many people and the general sentiment is that it’s time that he (Mugabe) retires,” Mawarire told ITV News. I think this time there is a sense that there is a generation that is no longer afraid. And this is one of the biggest things that has held Zimbabweans back over the last 36 years, is fear. In a video recorded before his arrest on Tuesday, Evan Mawarire urged supporters to go ahead with further ‘stay at home’ demonstrations. He had called for a one-day protest last week which closed businesses across the southern African nation in the biggest strike since 2005. Mugabe, 92, has led the former British colony since independence in 1980. Since then it has gone from being one of the continent’s most promising economies to being a country mired in economic crisis with a reputation for rights abuses. A copy of a search warrant seen by Reuters said police believed Mawarire was in possession of a stolen police helmet, baton stick and “other subversive material” that could be used to incite public violence. The law under which the 39-year-old pastor has been detained carries a prison sentence of up to 10 years. According to Zimbabwean law, he must appear in court within 48 hours. This generation is not afraid. We are not afraid of prison. We are not afraid of beatings. We are not afraid of intimidation of abductions. Yes it’s frightful, but we’ve got into a place where we’ve said enough is enough. “Let me warn the instigators behind the intended protests that they will face the full wrath of the law,” added Chombo, who was flanked by the ministers of defence and state security.